Working with Pixar to bring their popular license to a mobile game for the very first time. Disney-Pixar’s Cars license is one of most popular movie franchises in the world, with more than $1 billion in box office revenue and $10 billion in merchandising sales. The development team at Gameloft wanted to create a fun racing-tycoon game that stayed true to the beloved universe and its characters, while also enabling a successful IAP business model. It’s no secret that Pixar places great importance on story and character development in all of their films, and video games based on those films are no different. In addition to watching the films and playing the previous games, I visited Pixar’s Emeryville studio to meet with the Cars creative director Jay Ward. We discussed the core tenets of the franchise and how to approach the characters and the premise of the game. It’s important to stay true to the brand—not only for the business/license stakeholders, but also for the fans. The story guidelines for our Cars mobile game included featuring all the main characters from the first Cars film as well hero Lightning McQueen’s hometown of Radiator Springs. I was able to use almost all existing elements of the Cars universe from the first two films, so long as the stories didn't overlap with any previous games. I wrote all of the story elements—premise, dialogue, and copy—which were reviewed and approved by Ward. To allow players to empathize with someone who had to follow in Lightning’s tiretracks, we developed our very own main character—up-and-coming racecar Todd Marcus. Previously, Todd had been an unnamed background character in the films, so I had the freedom to flesh out his personality in our game, including writing original lines and crafting his character biography and motivation. 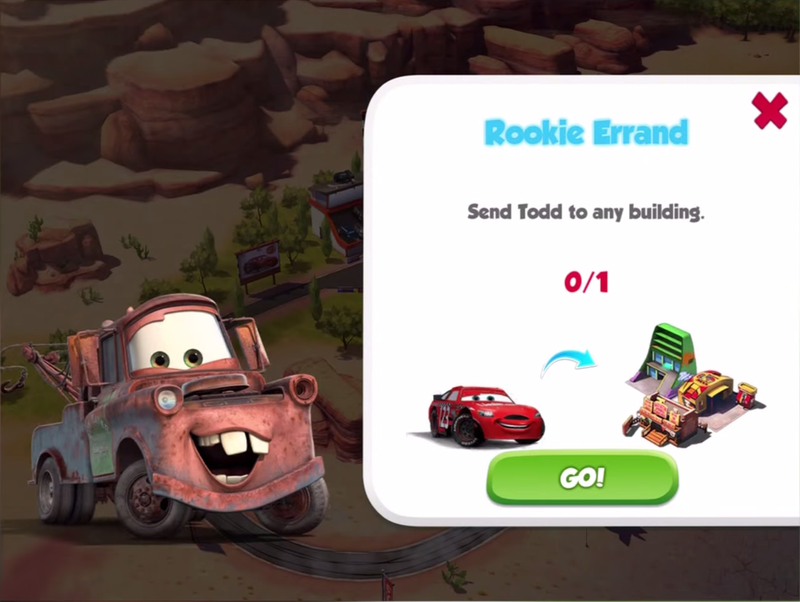 In Fast as Lightning, Todd is the first unlockable playable character; he comes to Radiator Springs to ask Lightning to be his mentor, and teach him how to be a better racer. Throughout the development process, I worked closely with the game designers to design macro- and micro-objectives, develop the premise of the story, flesh out playable and non-playable characters, and write the item names, item descriptions, and menu/UI elements. 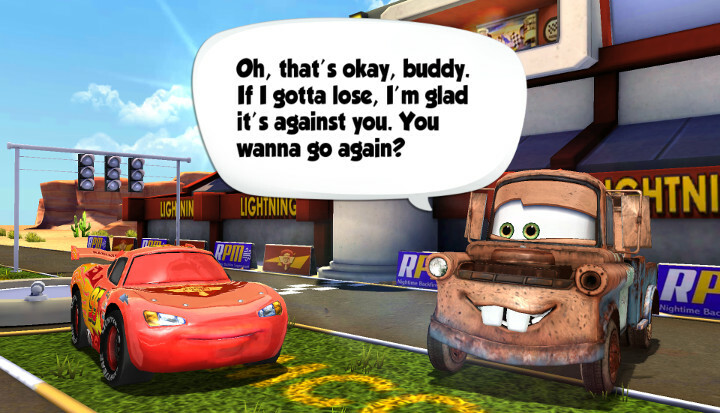 I also composed original voice-over scripts, which featured original voice actor Owen Wilson as Lightning McQueen. Additionally, I collaborated with the sound designers and the brand team to utilize existing voice/sound assets from the extensive Cars library. We conducted user research to ensure that players in our target audience (5-12 year-olds) understood the tutorial, the gameplay, and of course, the story of the game. I was able to observe players to learn about pain points in the story and gameplay, as well as interview players (and their parents) to understand their feedback on the game.